Roberto Mancini has to feel good after adding Mario Balotelli and James Milner to this group. Last summer was “fun” — bringing in names from top six Premier League clubs like Carlos Tévez from that club out in Stretford, Emmanuel Adebayor and Kolo Touré from Arsenal, Gareth Barry from Aston Villa, and Joleon Lescott from Everton. Each one of those was supposed to help City while weakening a competitor, and while the loss of all five of those players was felt in some form at their former clubs, the impact varied wildly. United definitely could have used Tévez last season and Arsène Wenger’s inability to replace Adebayor was a factor in the Gunners’ failed title challenge. However, Wenger did bring in an excellent replacement for Touré in the form of the much cheaper Thomas Vermaelen, while David Moyes (Johnny Heitinga) and Martin O’Neill (Stuart Downing) both managed to eventually make a tidy profit off of City while downgrading those positions only slightly. In the end, with the exception of Tévez, it felt like City’s summer deals may have done more for some of their rivals’ bottom lines than they did for their own squad. Mark Hughes had placed a huge emphasis on Premier League experience, but it could be argued that in the case of three of the six, he essentially was buying players deemed surplus to requirements at other clubs at a considerable markup. By comparison, this summer’s transfer activity seems much more about improving City than weakening others. Whereas last summer, all six signings were from English clubs, City went the continental route this time around. As a result, the prices weren’t nearly as inflated and there aren’t the same concerns about funding rivals’ war chests. It’s fitting that the only transfer fee deemed excessive by most observers was James Milner at essentially £24m — not coincidentally the lone English player and the lone domestic purchase. After last season, I wanted to see the club upgrade at both fullback positions and add a creative midfielder and at least one attacking player. Left back was the biggest concern, as Wayne Bridge had a rough 2009-2010 season on and off the pitch. When he wasn’t hurt, he wasn’t particularly impressive. Right back was a source of angst as well, as Micah Richards has all the physical attributes — athleticism, pace, and strength — you’d want, but has a nasty habit of switching off and can’t cross a ball to save his life. Pablo Zabaleta can get forward and send in a cross, but his lack of pace gives him problems against quicker opposing wings, and he commits too many fouls in dangerous places on the pitch as a result. Meanwhile, Stephen Ireland’s regression meant there was a paucity of attack-minded midfielders at the club. And the fact Benjani somehow appeared seven times for City tells you all you need to know about the lack of depth in the strike force. I was delighted when Jérôme Boateng was lined up as the first signing. As we saw in the World Cup, the versatile young German can play across the back four. At City, his pace, defensive prowess, and ability to get forward make him the best option at right back in the squad. Despite being someone who appreciates sample sizes, Boateng’s scintillating cross to Gareth Barry in the preseason friendly against Valencia was all I needed to see to be convinced he is the answer at right back. And it was great business at £10.4m — compare that to the £18m Liverpool paid for the defenseless Glen Johnson. City caught a huge break when Pep Guardiola decided he preferred Sergio Busquets’ disruptive abilities in Barcelona’s midfield to Yaya Touré’s box-to-box play. Unwilling to accept second-choice status, the Ivorian opted to leave the club, and Barça’s loss is now City’s gain. Having watched Touré week in and week out at Barcelona, I think he instantly rivals Michael Essien for the title of Best All-Around Defensive Midfielder in the Premier League. The younger of the two Touré brothers at City is what Barry was promised to be, but never quite delivered on: a true box-to-box player who will be the link between the defense and attack. He is an absolute mountain of a man, but also blessed with great pace, a great eye for a killer ball, and remarkable close control in tight quarters. Touré also can play a number of roles, as shown by his impressive display at center back in Barcelona’s Champions League final victory last May. The deal with Barcelona happened just as the Catalán club was going through serious short-term financial difficulty, which might explain why he cost City a relatively meager £24m. There were plenty of jokes about how Roberto Mancini would play all those defensive midfielders, with Barry, Nigel de Jong, and Patrick Vieira already at the club, but so far Touré versatility has allowed Mancini to play three of them together. I’m not sure he’ll be able to do so all season, and Barry may soon find himself on the substitutes’ bench to start matches. I think when all is said and done, his signing may rank up there with that of Tévez in terms of impact on the club. The move that seemed to turn the most heads this summer was the signing of David Silva. With Valencia seemingly teetering on the brink of financial oblivion for years now, it was a question of when and where he would go, not if. Real Madrid reportedly had been keen on the Spanish star and United have been long-time admirers, but in the end it was City who snatched him up, and for respectable £24m — far less than Valencia’s previous reported asking prices. Now that he’s at City, the naysayers appear to have landed on his small size as the rationale for their pessimism about the move, ignoring the fact he’s renowned for his toughness and fight in Spain. My concerns about Silva stem from his recent injury record and the fact he didn’t look to be in very good form this summer in South Africa. He’s been ineffective in his preseason and early season appearances for City so far, but he did provide fans a glimpse of his abilities with some sensational dribbling and cutbacks that nearly resulted in an unbelievable individual goal in last week’s Europa League qualifier. While most of us still think of Silva as a left-sided player from when he burst on a scene a couple of years ago, he’s been playing a more central role — almost as a withdrawn striker — for Valencia lately. I’m imagining him slotting in the middle of a three-man attacking midfield behind Tévez. I expect this one to pay off eventually as well. Left back was addressed with the signing of Aleksandar Kolarov from Lazio on July 24, following a somewhat protracted ordeal. José Mourinho since has come out and said he wanted the Serb at Real Madrid, but that he was unable to compete financially with City. This seems a bit odd since City reportedly got their man for an un-Earth-shattering £16m. Considering that the Madrid club paid a reported £28m for Karim Benzema last summer, you’d think they could come up with that kind of cash. Thanks to the ankle injury suffered in the first half of the opener, we haven’t seem much of Kolarov in a City shirt. He looked incredibly impressive in his preseason debut against Valencia, causing the opposing defense all sorts of problems with some great crosses, and his corners and free kicks look lethal. I fully expect Kolarov to supplant Bridge at left back and emerge as one of the better players in the Premier League at the position, giving Mancini a pair of fullbacks who defend well and also contribute nicely to the attack. The strike force got its upgrade in the form of Mario Balotelli last month, as the young Italian star was reunited with the manager who gave him his senior debut at Inter Milan back in 2007 at age 17. After famously not getting on with Mourinho, Mancini could be the father figure the youngster needs to mature, as that’s the only aspect of his game in question. In 40 Champions League and Serie A starts and 33 substitute appearances, Balotelli netted 22 times and recorded 13 assists for during his three seasons playing for the Milanese club. His £24m price tag might seem a bit high for a somewhat unproven player, but such is his reputation that I don’t recall seeing a single eyebrow raised at the fee paid by City. 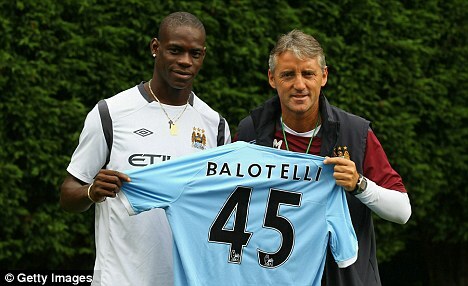 Like most of his fellow summer signings, Balotelli is versatile, able to play all over an attacking line. From the Inter matches I’ve watched the last couple of seasons and the brief glimpse of him we got at Timişoara, he’s at home playing out on the wing, which means he could fill the Craig Bellamy role as a forward playing out wide. He has great pace like Bellamy, but that might be where the comparisons end, as he is much bigger and stronger than the Welshman. Free of the mindboggling racist abuse he endured in Italy, I expect his contributions on the pitch to get much more attention than his behavior, which usually was not the case with Inter. Most people seem to regard him as a future star of the game, and at age 20, he could just be scraping the surface of his talents. The sixth and final signing came with the much-anticipated end to the James Milner transfer saga on August 18, with Ireland and £16m heading down the M6 in the opposite direction to Villa Park. After hearing about this one nearly all summer, the Milner-to-City fatigue and Ireland’s outrageous, headline-grabbing introductory press conference both nearly made Milner’s signing a secondary story. In the end, most of the reaction tended to be disapproval at the estimated £24m City paid for the young England starter, once Ireland’s estimated £8m valuation was factored in. 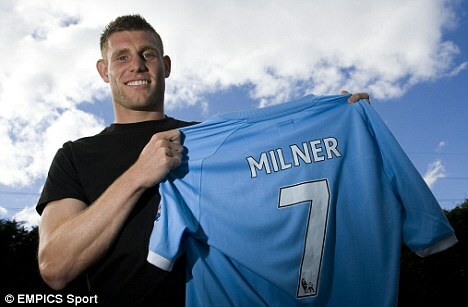 Milner might seem a bit unnecessary after the capture of Silva, but I think they’re complementary players. Milner plays the game like a predator, aggressively taking on markers and using power to his advantage, while Silva’s more about guile and slipperiness. If you’re starting to sense a theme here, Milner brings a great deal of versatility to the table, as he can play on either wing and also centrally. When Tévez is deployed as a long striker and City don’t have aerial threats in the box, Mancini can play Milner and Adam Johnson inside-out, with the right-footed Milner on the left and the left-footed Johnson on the right. When Adebayor and/or Roque Santa Cruz are in the game, Mancini can go more traditional and switch them back to their natural wing positions for crossing purposes. The two of them can and do switch wings during matches, which we saw on City’s opening goal against Liverpool, where Johnson played Milner through on the right side. In the end, I’m okay with the price paid for Milner, as I was incredibly impressed with him nearly every time I saw him play last season, and I think he brings something different to the table at Eastlands. The best thing about this summer’s crop of signings for City is that there doesn’t appear to be any Santa Cruz — an overpriced player brought in more out of familiarity and with a questionable medical history. In some sense, the man nicknamed “Crocky” by City fans almost is like a new signing himself, given that he played all of 810 minutes for City in last season’s injury-marred campaign — the equivalent of nine full games for the mathematically challenged. The only thing seemingly missing from this summer would be a front-line striker. City are an upgrade at center back and a top striker away from really giving Chelsea a run for their money. I wanted to see either Zlatan Ibrahimović or Edin Džeko brought in, but until someone along the lines of Fernando Torres arrives next summer, we’ll have to hope Adebayor can stop sulking and live up to his potential. It should prove another interesting season for City fans, with another batch of new faces in the squad. Hopefully we see a better return than last season’s additions (apart from Tévez) were able to provide.